Arkansas hospitals such as Arkansas Children’s Hospital are nationally ranked for their care of high-risk and premature infants. Even so, medical staff can still make mistakes. In children with highly sensitive health issues, these mistakes can translate into severe complications and lasting neurological issues, If you or a loved one had a birth injury in Arkansas, you may be able to ask that an attorney assist you in obtaining compensation for care, future medical expenses and other needs, whether you are in Little Rock, Fort Smith, Fayetteville, Springdale Jonesboro, Conway, Rogers, Pine Bluff, Bentonville or another Arkansas city. Reiter & Walsh ABC Law Centers is one of the only law firms in the United States that exclusively takes birth injury cases. Our unique focus means that we have a thorough knowledge of the complex medical aspects of birth trauma cases. Our focus also allows us to work with leading experts, top medical specialists and life-planning professionals through every step of a birth injury case. Partners Jesse Reiter and Rebecca Walsh are currently recognized as two of the best medical malpractice lawyers in America by U.S. News and World Report, and Euel Kinsey has been registered in the American Registry of the Finest Lawyers in the World, as well as in dBusiness Magazine’s Leading Lawyer list. If your child experienced a birth injury, contact the Arkansas birth injury attorneys at Reiter & Walsh today at 888-419-2229. Arkansas Children’s Hospital: Arkansas Children’s Hospital is known as one of the best in the state, with a 104-bed NICU and subspecialists available 24 hours a day. Mercy Fort Smith: Mercy Hospital Fort Smith is the only hospital in the River Valley region to receive a Perinatal and Neonatal IIIA designation. Northwest Health System: This designated level III facility, located in Willow Creek Women’s Hospital in Johnson, Arkansas, is the largest NICU in Arkansas’ Northwest region. To see a list of the different NICUs in Arkansas, as well as their categorization (with Level IV being the level of care needed for the sickest babies), please see the Arkansas Department of Health. The state of Arkansas houses numerous medical research facilities, with some of the most well-known being the University of Arkansas and the University of Arkansas for Medical Sciences. The University of Arkansas aims to move into the ranks of the Top 50 public research universities in the U.S., focusing on health and nanotechnology as two of their six areas of focus. The University of Arkansas for Medical Sciences (UAMS) is Arkansas’ only comprehensive academic health center. It operates outreach programs in all of the state’s counties, and has eight regional centers and seven specialized research institutes. There are two legal programs in the state of Arkansas. One is housed at the University of Arkansas in Little Rock, while the other is at the university’s branch location in Fayetteville. The University boasts of its ranking in National Jurist’s Magazine’s Top 20 Values in legal education and U.S. News and World Report’s top 45 public law schools. There are several military hospitals in Arkansas. If you obtained care in one of these hospitals, it is likely, if you experience medical malpractice, that you would file a claim under the Federal Tort Claim Act (FTCA), which provides an outline of a different process for filing a claim. For an attorney to successfully litigate a case of this type, they must have experience with military medical malpractice. The attorneys at ABC Law Centers have brought on highly experienced staff who have focused specifically on military malpractice, allowing them to successfully help the families of children with birth injuries sustained at military hospitals. Birth injury is a very complex topic because a baby may receive diagnoses that are inter-related. For example, a brain bleed (intracranial hemorrhage) might occur concurrently with HIE, resulting in cerebral palsy and developmental delays. The root cause of these diagnoses may be a medical error such as a medical staff member failing to recognize the signs of a stalled labor. Because of these inter-related factors, having a birth injury lawyer who focuses specifically on birth injury is very important. It is important to bring these cases up with an attorney as soon as possible, because of the ‘statute of limitations,’ which limits how long a person has to file a case. Cerebral palsy: This motor disorder can result in abnormal gait, muscle tightness, spasming and abnormal muscle movements. This disorder is due to brain damage and is not progressive (meaning that it does not worsen over time). Hypoxic-ischemic Encephalopathy (HIE): One of the most common birth injuries, HIE occurs when a baby’s brain is deprived of oxygen for too long, causing certain parts of the brain to be damaged. In some cases, babies are diagnosed immediately after birth, allowing them to get hypothermia therapy within 6 hours of birth to mitigate the risk of disability. In other cases, HIE goes undiagnosed until their child begins to grow, and they consult a second opinion as the child begins to miss developmental milestones. Traumatic Delivery: Difficult deliveries can result in birth trauma from the use of forceps or vacuum extractors, as well as from attempts to deliver a baby that is improperly positioned (face or breech presentation) or too large to fit through the mother’s pelvic opening (macrosomia and cephalopelvic disproportion/CPD). Medical practitioners should recognize signs that a birth may be traumatic and follow standards of care to avoid injury. Overusing Pitocin, Cytotec or anesthesia: Pitocin and Cytotec can cause uterine hyperstimulation, which makes the uterine muscles contract too fast and too strongly, causing oxygen deprivation. Incorrect anesthesia can can a mother to develop blood pressure that is too low, which compromises blood flow to the baby. Face or breech presentation: Babies are usually delivered head-first. If a baby’s head is not tucked towards its chin, there is a significant risk of head trauma. If the baby is delivered feet-first, there is a high risk of the umbilical cord being delivered before the baby, which can cause cord compression and oxygen deprivation. Preeclampsia: When a mother develops high blood pressure during pregnancy along with protein in her urine, it may be a sign of preeclampsia, a disorder that can become severe very quickly, resulting in seizures in the mother and potential oxygen deprivation in the baby as blood flow through the placenta is restricted. Physicians must monitor patients with preeclampsia closely and schedule early delivery to prevent severe adverse health effects. Delayed emergency C-section: There are certain criteria for when an emergency C-section is needed. These include if labor fails to progress, if the baby cannot fit through the birth canal, and if the baby is showing signs of fetal distress (when the baby’s heart rate changes very suddenly). Emergency C-section have to be done within a short time frame (usually less than 30 minutes, though in some cases less than 18 minutes, depending on severity). If the time ‘decision-to-incision’ is longer than standards of care indicate, medical practitioners are committing medical negligence. Placental abruption: Usually, the placenta stays fully attached until after the baby is born. In a placental abruption, the placenta detaches (partially or completely) before it is time. Early placental detachment means that the placenta can no longer supply oxygen to the baby. A mild abruption can turn severe very quickly, requiring close monitoring and potentially immediate delivery if the child is showing signs of fetal distress. Infections: If the mother has an infection like chorioamnionitis, villitis, bacterial vaginosis (BV), Group B Strep, herpes, or other viruses, medical staff must take certain measures to ensure that the infections will not be transmitted from mother to baby, because infections in a baby can become extremely serious very quickly, causing meningitis and inflammation of brain tissue. There are routine tests that medical staff should be conducting to ensure the mother is infection-free. Alternatively, if the mother has an infection that cannot be cleared in time for delivery, there should be discussion about alternate delivery methods that will decrease transmission risk. Meconium Aspiration Syndrome (MAS): If a baby inhales its excrement during birth (which can occur if the baby is in distress), medical staff should take action to prevent sepsis and assist the baby in breathing if needed. Meconium aspiration can cause infections and sepsis, and also obstruct the baby’s airways, preventing it from supplying sufficient oxygen to its tissues. A baby that can’t fit through the pelvis (Macrosomia and CPD): If a baby is significantly larger than normal (macrosomia), the risk that the baby will not be able to fit through the mother’s pelvic bones increases. In cephalopelvic disproportion (CPD), the baby’s head and the mother’s pelvic size is mismatched, which mean that the baby can be too large to be born via vaginal delivery. Medical staff should be monitoring a fetus’ size as it gestates to track how much the baby is growing, and to develop a birthing plan with the mother that takes into account possible health risks. Severe bleeding: Traumatic birth can result from the use of assistive instruments, as well as repeated attempts at vaginal delivery when a baby is unable to fit through the birth canal. This can also occur if labor drugs are overused, resulting in contractions that continue when attempts at vaginal delivery have already failed. If a baby has a period of oxygen deprivation, this destabilizes the cell membranes in brain cells, making brain bleeds much more likely. Medical staff should be following standards of care in mitigating the risk of underlying health conditions and complications that can cause brain bleeds and resulting damage. Our track record of successes have ensured that numerous families have gotten compensation for their child’s therapy, medical treatment and lifelong needs. We will never charge any fees until you win your case, and will walk you through each step of the litigation process so that you are always up-to-date. The attorneys at ABC Law Centers have been practicing law for decades. 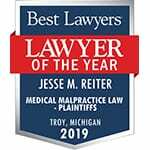 President and Senior Attorney Jesse Reiter began legal practice in 1987, and began ABC Law Centers in 1997, devoting his efforts solely to birth injury. Unlike other large personal injury firms which focus on multiple areas of personal injury (such as car accidents, medical device malfunctions, and class-action drug side effect lawsuits), ABC Law Centers’ in-house medical staff and experienced attorneys bring the in-depth medical and legal expertise needed specifically for understanding the complexities of a birth injury lawsuit. The firm has been listed in U.S. News and World Report’s list of “best medical malpractice firms’ for numerous years. The Arkansas birth injury attorneys at our law firm focus solely on birth injury cases, which means that we have a thorough knowledge of the complex medical content associated with birth injury cases, plus top-notch, award-winning medical, economic and forensics experts at our side. Contact us online for a free consultation or call us at 888-419-2229.